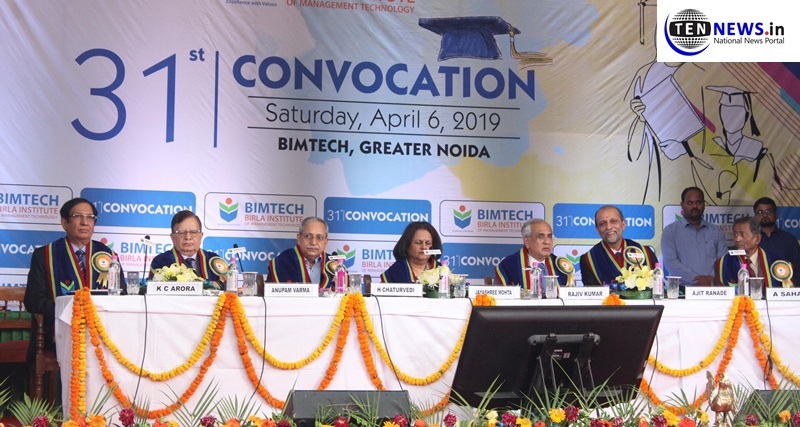 Greater Noida (07/04/2019) : Chairperson of BIMTECH’S board of governors, Jayashree Mohta declared open the 31st convocation address and delivered the welcome address. “We are doing consultancy and capacity building in different parts of the country apart from workshop on CSE for agricultural development workshops. We have also established a BIMTECH pushtakalaya at different jail’s of Uttar Pradesh”, he said. “Fifty four students went to different countries including Australia, France etc as part of student exchange program. BIMTECH also has an Atal Incubation Centres”, he added. “The entire Ayushman Bharat was incubated in NITI Aayog. 38% children were malnutritioned in the country which has been brought down to 34%. The e-mobility mission is housed in NITI Aayog. We are working in integrated medicine concept as of now to get Ayurveda and traditional form of medicine, their due recognition”, he said.